Lucien Thévet was the last of the horn players of the traditional French school and was called by one critic "Prince of the Horn." In addition to his orchestral playing, he performed all the major solo repertoire, premiered pieces composed and dedicated to him by Le Flem, Françaix, Passani, Landowski, and the Poulenc Elegie (accompanied by the composer), and gave the French premieres of the Britten Serenade (1945 with Peter Pears) and Strauss Concerto No. 2. (1950). He recorded the Ravel Pavane eight times and performed it in concert many more times. His style included vibrato, as was typical of the French school. Thévet was born in 1914 in Beauvais, France. He studied with his father, an amateur musician, from the age of six, and by age 13 was a soloist with the local band. He studied with Raymond Carlier (not a horn player, but well-rounded musician who played several other instruments) and later with Fernand Reine and Edouard Vuillermoz at the Paris Conservatory, receiving a first prize in 1937, and was appointed principal horn of the Paris Radio Orchestra. 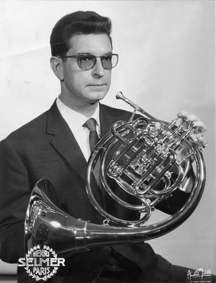 Thévet was also principal horn of the Paris Conservatory Orchestra (1938-1967) and the Paris Opera Orchestra (1941-1974). Charles Munch offered him the principal horn position with the Boston Symphony Orchestra, but Thévet declined. In a famous incident at the Paris Opera, Thévet was called to the stage for numerous curtain calls after playing the off-stage solo in Wagner's Siegfried, an event that was reported in the press. The press also praised his solo playing: "Mr. Thévet gives the impression of perfection with his confidence, incredible flexible phrasing, and beautiful sound." Thévet made many solo recordings in addition to recordings with the Paris Conservatory Orchestra and Paris Opera Orchestra. Thévet taught at the Paris Ecole Normale de Musique, the Nineteenth Arrondissement Conservatory, and for 34 years at the Versailles Conservatory. Students came from all over the world to study with him. Thévet would take students at any level. He taught beginning students in concert pitch, and he taught transposition by clefs rather than intervals. 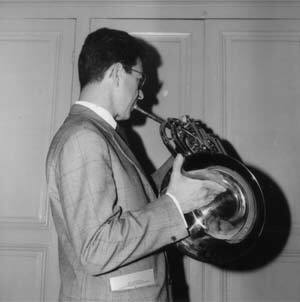 Thévet played a Selmer horn with piston valves and an ascending third valve (described in the Autumn 1973 issue of The Horn Call). In 1950, he became technical advisor for the Selmer company, and in 1964 he designed a new model of horn for them. Alphonse Leduc published Thévet's Méthode Complète de Cor (1949). Other publications include Sixty Studies for Horn, Fifty Transposition Exercises for Horn, Sixty-five Sight-reading Studies for Horn, One Hundred Rhythmic Exercises in Two and Three Parts for Instruments in the Treble Clef, and Transposition: A Method for Conductors, Players, and Arrangers. Thévet was made a Knight of Arts and Letters, was Honorary President of the French National Association of Horn Players, and was elected an IHS Honorary Member (1978). The November 1995 issue of The Horn Call contains an homage to him on his 80th birthday as well as an article by him. Two tributes appear in the October 2007 issue. Hand position picture courtesy of Pete Exline.